Judging from the questions pool owners ask on the internet, they are having a hard time with water clarity even when they think all the chemicals are balanced. 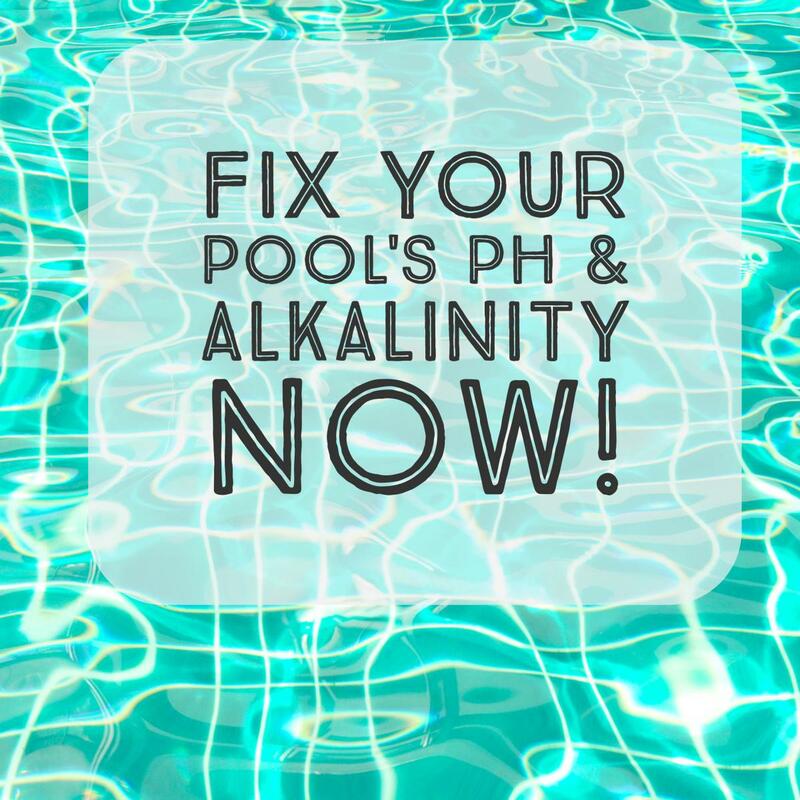 We will discuss in this article why chlorine, pH, and alkalinity are only the beginning in maintaining clear pool water, and then we will troubleshoot the problem. Just to summarize, these are the basic chemical requirements for a pool that stays clear. But there is a little more to it than the basics, as you can see in Question 2 below. Free chlorine. Unless the water has a sufficient level of free chlorine, algae will grow and make your pool green and cloudy. Correct pH. For normal use, your pool’s pH should be between 7.4 and 7.6: for shocking, it should be between 7.2 and 7.6. Shocking a pool with too high pH will cause cloudiness. Correct alkalinity. The right range of alkalinity (dissolved salts that keep pH stable) makes pH and chlorine levels easier to maintain. So What Do I Do Now With My Green and Cloudy Pool? Read each of the five questions below: at least one should relate to the problem you are having. Most of these questions are based on real keyword searches that have found some of my articles. Just to summarize my experience: a bad filter is the most common cause of cloudy pool water. 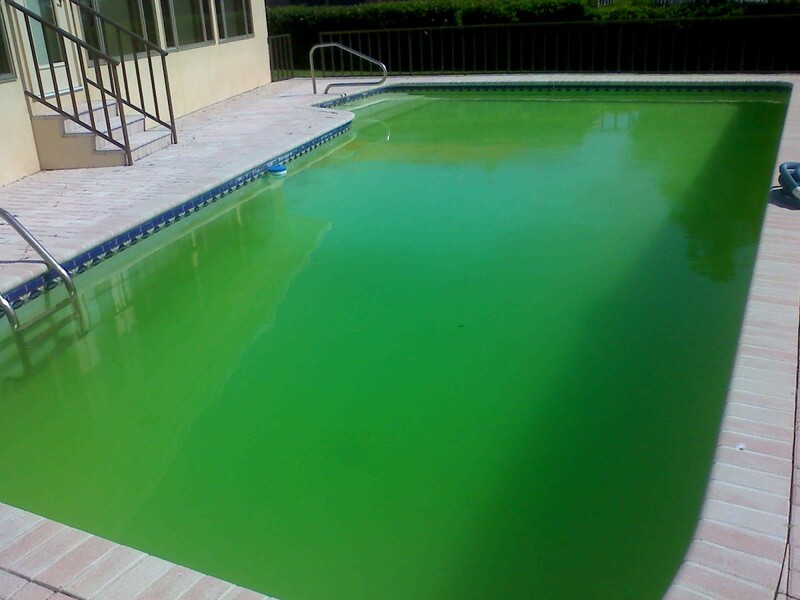 Green pool water is caused by a bad chemical balance, usually something other than just low chlorine. 1. I Shocked My Pool, So Why Is It Still Cloudy? If your pH is not too high, filtration issues are likely the cause of your cloudy pool. The issue may depend on the type of filter. If you have a sand filter, it could take a week or more for the pool to completely clear. That's even if it's a good working sand filter. If you have a cartridge filter, it needs to have a good cartridge. A cartridge can only handle so much. 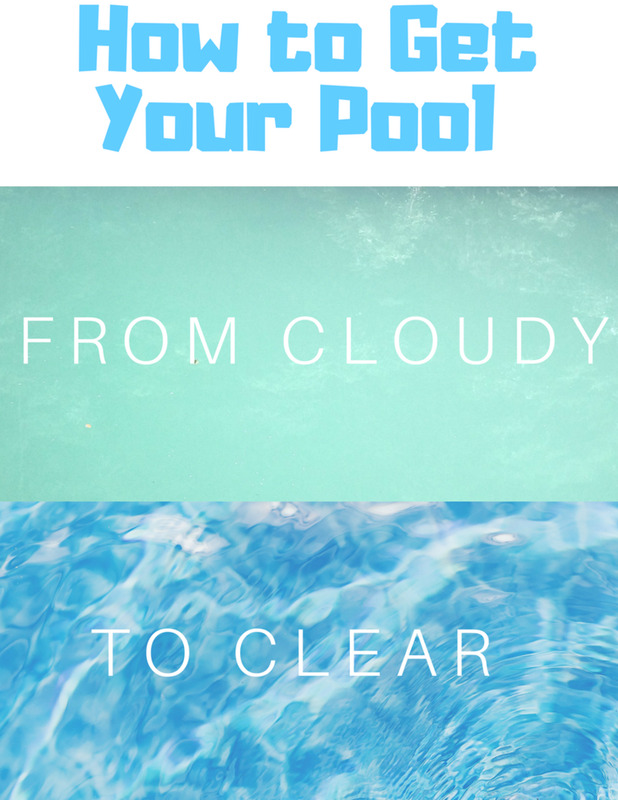 If your pool is cloudy, the cartridge needs to be cleaned DAILY until the pool is clear. or the filter is defective and not working properly. Do you have torn filter grids? A broken manifold? Does DE powder shoot back into the pool when you add it? If so, the filter needs to be taken apart and cleaned or repaired, and your pool will remain cloudy until the repair is made. So remember, a cloudy pool can be caused by a bad filter. If the pool is being filtered properly, you won't need a clarifier solution. In some cases you can use a flocking agent, a product called "drop out" or "drop and vac," that will bind small particles together and sink all of the algae to the bottom of the pool where it can be vacuumed up as waste. 2. I Shocked My Pool, So Why Is It Still Green? This is one of the most often searched questions. High levels of the wrong chemicals may be the issue. Let's take a look at reasons why your pool may still be green even after you've exhausted yourself adding tons of chemicals. Stabilizer. Over time, if you use tablets (like Tri-Chlor) to supply chlorine, levels of the stabilizer from the tablets (cyanuric acid) can become elevated over time and “lock up” the free chlorine molecules (Cl2). Even if you get a very high chlorine reading on your test kit, the chlorine is simply not able to work at killing algae because it’s not in the right chemical form. This article shows you how to lower stabilizer levels. Phosphates. High phosphate levels can definitely cause algae problems. Phosphorus, or phosphate, can enter the pool by leaching out of leaves or organic debris in the pool, or drifting there from fertilizer sprayed near or around your pool. Because algae feed on phosphates, algae blooms due to phosphorus can become overwhelming in the summer months when the water temperature exceeds 78-82° F. This condition is easily treatable with a phosphate-removing product like this one. 3. How Much Shock Should I Add to the Pool? Did I Add Enough? "Shocking" a pool that has turned green is better known in the industry as "super-chlorination." 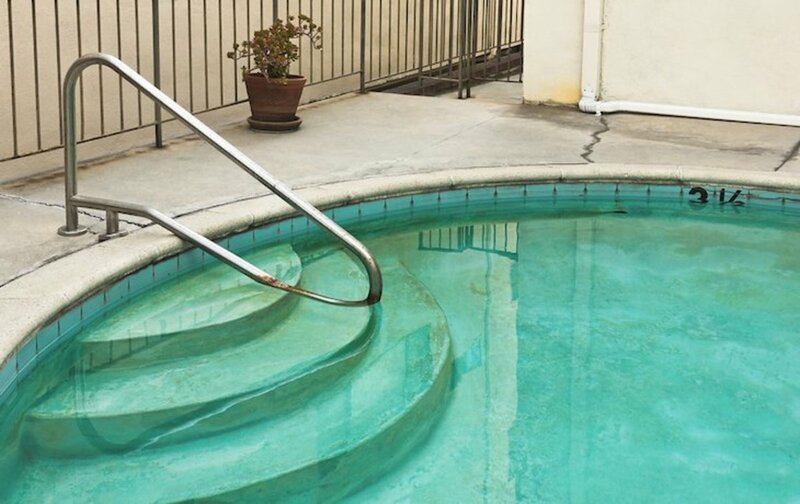 When shocking the pool, consider a few factors. How big is the pool? How "green" is it? If your pool is a normal residential-sized pool of 13,000-25,000 gallons (the pool pictured at the top of the article is around 18,000 gallons), then your options are liquid chlorine or granular shock. The choice depends on what type of filter it has. If it is a sand or cartridge filter I will use liquid chlorine, about 10 gallons, or four of the yellow "Jerry-jugs." The reason I use liquid chlorine is that granular chlorine will leave a residue that is harder to filter out. If the pool has a DE filter, then I will use granular chlorine (about 5 pounds). This article shows how I shock a pool with a DE filter. Remember to test the water before adding shock. The pH should ideally be low when shocking the pool (around 7.2) because shocking the pool will raise the pH level. Remember that shocking alone does not clear up a green or cloudy pool; that is what the filter is for. It doesn't matter how much shock you put in the pool if you have a bad filter. 4. Will the Pool Turn Green If I Don't Add Chlorine? Believe it or not, I have seen this keyword search pop up more than once. There is a short answer: YES, IT WILL turn green if you don't add chlorine. Pool water must have a sanitizer or something that will kill bacteria and algae. Algaecide alone without chlorine will not prevent the pool from turning green. 5. How Long Should I Run the Pool Pump? Am I Filtering My Pool Enough? Always run the pump when shocking the pool and allow it to circulate for 24 hours. The water should then be a blue or cloudy blue color. Test the water 24 hours after shocking and start adjusting pH and alkalinity levels. The chlorine will still be elevated, but over a few days it should stabilize. To lower the chlorine level, you could add sodium thiosulfate, but I do not recommend this, because adding too much can cause the chlorine level to seesaw back and forth. 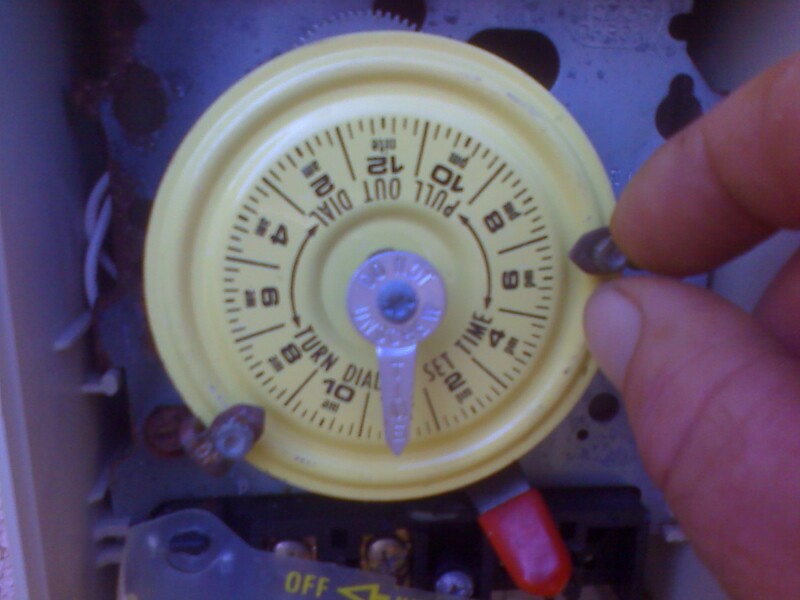 After the shocking process is complete, and you are back to normal operation, you need to set your timer so the pool is filtered for a long enough time each day to deal with any algae or debris. How long to run the pump depends on the turnover rate: the time it takes for the circulation system to move the entire volume of water in the pool (the number of gallons) through the filter equipment. During the hot summer months, an average-size residential pool that is in use should be filtered for a minimum of eight hours. During the cold season (since algae grow slowly in cold water), or when no one is using the pool, the filter time can be cut in half. But the pool water does need to be filtered whether it is being used or not. I put the hth Super Shock green to blue 1 in my above-ground pool, and now it's light green. What should do I do next? After shocking the pool, it will need filtration and circulation. Run the pump as much as possible. Keep the filter clean (daily) until the water runs clear. 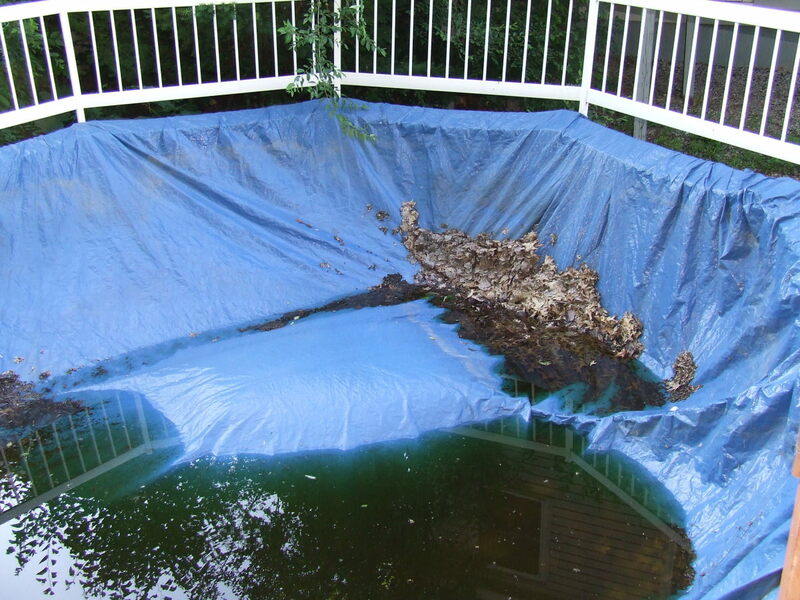 Be sure to brush the pool often during this process as above-ground pools do not have drains at the bottom. A clarifier solution can also be used to help out. How long do I backwash the sand filter of my pool? Sand filters require a longer backwash time than a DE filter. Both work by reversing the flow and blowing buildup and debris to waste (or backwash hose) In my personal experience with sand filters, a solid 2 minutes is sufficient. I have heard that backwashing a sand filter for 5 minutes is good. Unfortunately, you'll lose several inches of water if it's backwashed that long. So, a good tip would be (and this is what I do for sand filters). Backwash for 90 seconds. Bring valve back to filter position and run for one minute. Backwash again for another 60 seconds. Should be good to go after that. If you have a "multi-port" valve then there should be a rinse cycle. Run the rinse for 30 seconds after following the above steps. My pool is green. The alkalinity is 180 and the pH is 6.8. What can I do to make it clear? Balancing the chemistry will be the first step. Start with chlorine, pH, and alkalinity. Without knowing the volume (gallon size) of the pool, I can not answer this accurately. Please try this pool chemical calculator for adjustment and dosage amounts. After vacuuming the pool how long should I wait before checking chemical balance? Vacuuming the pool will not affect the chemistry readings. It can be tested before, after or even during vacuuming and the results will be the same. I have an above ground 24 x 52 round pool. I have cleaned the pool and started with clean water. We have rust in our water. I have put 32 ounces of algaecide along with 4 shocks, and 5 bottles of chlorine. The water is green. I have a sand filter with brand new sand. What can I do? Above ground pools can be difficult when trying to get rid of algae, only because there is no "Main drain" or a drain at the bottom of the pool which helps the filtration process greatly. 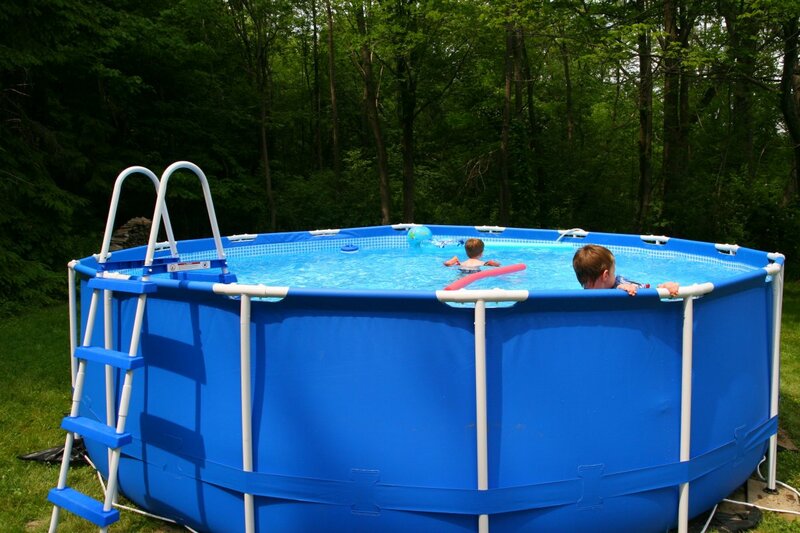 An above ground pool usually only has a surface skimmer. If you've started with clean water, small amounts of chlorine should be added while filling. As far as rust being in the water, you need a metal sequestering agent which will remove the metal from the water. There are a couple of different ways to address the "green" in the pool. Since you have a sand filter, there should be a backwash mode in which the water is pumped to waste. Ideally, if your filter is equipped with a "multi-port" valve, then there should also be a "waste" setting on the valve. Brush the pool, add a floccing agent (this will drop all algae to the bottom of the pool) and then vacuum everything that has dropped to the bottom out to waste. Another option would be to brush the pool often and run the filter as much as possible. Unfortunately, sand filters have a higher micron count and take much longer to clear a green pool, especially if there is no main drain. The water would need to be continuously stirred up to be able to filter it through the surface skimmer. If all else fails, drain the pool and re-fill being sure that a metal sequestering agent is added to counteract the rust in the water. I used the "Green to Blue" product and the next day the pool water was clear, but I see green in the middle of the pool on the bottom. 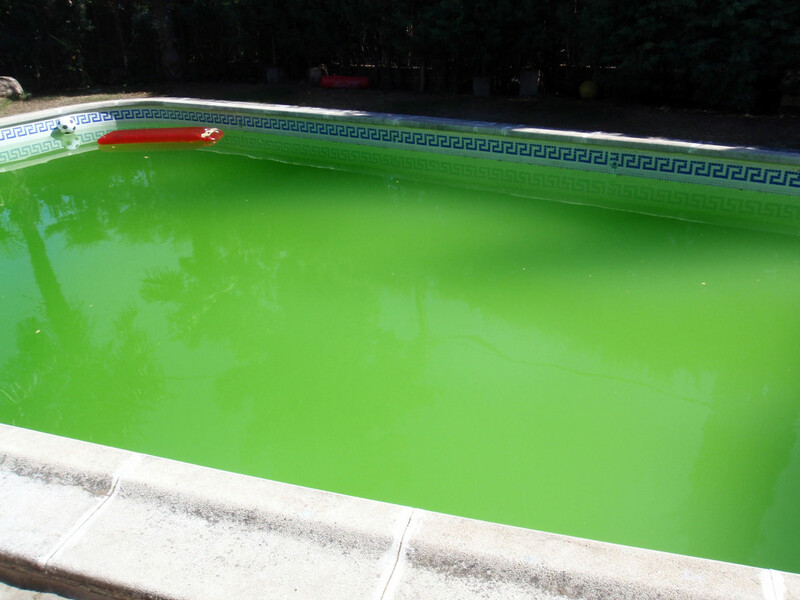 I tried to clean it, but then the pool is all green again. Do you have any advice? So what has happened is the dead algae sank to the bottom. If you vacuumed, the filter would not catch everything, so a lot of it shot back into the pool. When adding a floccing agent, allow everything to settle to the bottom. It will then need to be vacuumed to waste. Hopefully, your filter system has a waste valve otherwise you will continue to just recirculate green water. The pool has algae on the walls but is clear. Why did it turn a cloudy white color right after I shocked it with two packets of shock? In the pool industry, we refer to this as "smoking the pool". This happens when a granular shock is added while the pH is high and alkalinity is unbalanced. This can also be resolved quickly by balancing the pH and alkalinity. 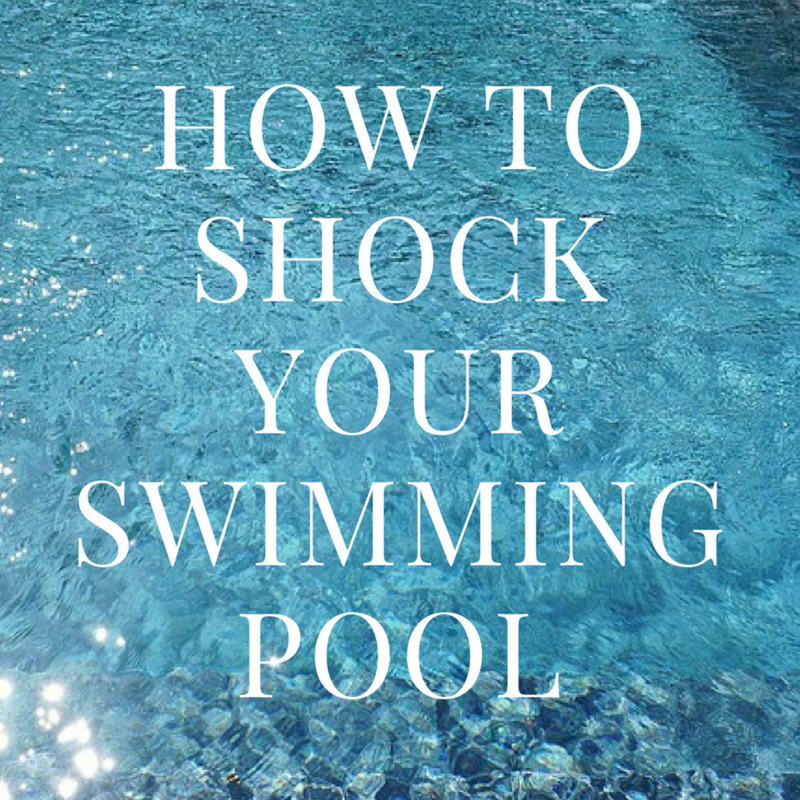 Before adding granular shock to the pool, be sure the pH range is between 7.2 and 7.4. The alkalinity should be 80 to 120 ppm, with 90 to 100 being ideal. My chlorine tabs got wet, can I still use them? Of course. They are activated by moisture. Our pool has turned green over a short period of time. For the last two weeks, it's been about 90° with monsoon rains about every hour, every other day. Do you think the pool turned green that quick or maybe had some help from a disgruntled former employee? During very hot weather along with progressive rainfall, it doesn't take much or very long for a pool to turn green. Without knowing what the chemical readings were the last time they were there or how well the filtration and flow is, it's difficult to say if anyone has added chlorine reducer to cause it to turn green. I would lean more toward the heat and rainfall that has caused the problem. How does too much calcium (hardness) affect pool water? High calcium levels can cause scaling while low levels will eat at the plaster. My husband says the water turns green as soon as we take the cover off, is this true? Should I run my pool sweeper if I have too much chlorine in the pool? Running the automatic pool sweep will make no difference or have any effect whatsoever on the water chemistry. I use a cellulose fiber filter for my pool. Which is better, granular shock or liquid shock? Cellulose fiber is used in place of DE powder. It works great, sometimes too useful since it has such a low micron count that the only thing that passes through it is water (needs to be cleaned more often). Filters out virtually everything else. If you add granular chlorine, as long as it's not added through the skimmer, will dissolve. Since sodium hypochlorite (liquid chlorine) is already dissolved, it's even better although liquid chlorine has a higher dissolved solid content. I use liquid to elevate chlorine when needed and granular if I am shocking the pool. How often do you change the sand in a sand filter? Every 3 years is recommended unless the filtration quality begins to diminish before that. How do you clean a sand filter in a pool? A sand filter is cleaned by reversing the flow of water through the filter by using a diverter valve to push the gathered debris out through a waste line or hose (back-washing). If this question refers to actually changing the sand, this is done by removing the filter lid and vacuuming out the old sand with a Shop-Vac then replacing it with pool grade sand. How long after increasing the alkalinity do I wait to shock the pool? Before shocking the pool, be sure the pH is between 7.2 and 7.6. Alkalinity should be at least 80 ppm and no higher than 120 ppm. (90 - 100 ppm is ideal) If an increase is needed, add the sodium bicarbonate or "alkalinity up", then allow the water to circulate for at least one hour and then re-test the alkalinity level. Once these levels are balanced, the pool can be shocked. How do I determine the gallon size of my pool? Do I need to add calcium to my above ground pool? Calcium is essential to maintain in ANY pool. Water needs calcium. If the calcium chloride level falls below 200 ppm and is not added, the water will still get the calcium that it needs by pulling it from the surface, pool liner, plumbing anywhere that calcium can be extracted from. It's important to maintain a proper calcium hardness level to prevent any scaling, staining or damage to the pool and/or pool equipment. Ideally, the calcium level should be maintained between 200-400 ppm. How do I lower the pH of my pool? Add pH reducer or muriatic acid. Hi, for the first time in 20 years of owning this pool, we've struggled with cloudy water and algae all summer. We've never before had an issue managing the chemistry, and usually have crystal clear water. Have had the water tested multiple times and local pool store is out of ideas. We brush the walls/bottom then shock, then after the water starts to clear, use a floc to settle out the remainder and vacuum to waste. But pool never completely clears, and algae starts to grow again within a week, even with high remaining chlorine (5+ ppm). 16,000 gallons. Sand filter running 24/7. Sand was replaced in June. Pool is green--is the same color it was 48 hours ago when we shocked it, using liquid shock. There has been zero change. Help? Any ideas? We're at a total loss, and so is our local pool store! I have a 5500 gallon pool that has had issues staying clear. we have had people fired over and still cant find the issue. we took the water to be tested and shocked it, got all new spider valves. Vacuum it and scrub it every other day. It has rained a a lot however the color started before hand. The temp is around 78, ALK varies from 60 to 80, and the PH Level is 7.4 to 7.6. chlorine has varied a lot in the last week. I just opened my above ground pool (15ft round x4 ft high) and it was super green and yucky. I purchased a new pump and filter and shocked my pool Sunday night and took some water to the pool store and was told it was locked up so to shock again so I did that last night. I have had the filter running since Sunday afternoon. the pool is still green and cloudy and all levels are showing very low. I don't know what to do next? wait it out? we clean the filter 3 times a day. Hi Kim. Sorry to hear the pool looks so bad. Sometimes people don't like to hear this, but in this case the only advice I'm going to give is to drain pool and start over. By the time you exhaust all of your time, energy, and cost of chemicals it will be worth the cost of some water. The filter element can only handle so much. It will need replaced soon because trying to filter it all out and cleaning it constantly is very hard on it. There is really no way of me knowing why it's not holding chlorine without being able to do a full range chemical analysis. I hope this helps. HELP! I am very frustrated. We have a pop up 15 x 48 pool. Just got back from a 1 week vaca and the pool was a very dark green from algae growth. I shocked it and added algae killer. Now its been 2 days and it still has some green but VERY cloudy! I am cleaning the filter cartridge 3 times a day. No cover on the pool, exposed to the sun. What am I doing wrong? How long will this take to totally clear up? Why do my test strips say there is NO chlorine in the pool (even though I've shocked and have added 6 oz of chlorine 24 hours later) and the PH is way too high even though I have added PH minus? Do the test strips even work?? Do I now have too much chlorine in it so the strips won't read it?? We've tried everything that we've googled, that's applicable. Why is the pool water still green? This has been an ongoing issue for about 3 weeks now. Hi Tony. Yes. It's dangerous. So many diseases in pool water that is not treated and filtered. No wonder my neighbors pool is green! Lots of insight thanks so much.